The world seems to be increasingly comfortable with most of our embodied lives being reduced to the digital, and for some things that is perhaps neutral—but life together is something that is hard to do outside one’s body. When I lived in Philadelphia, there was a neighborhood bar where I would somewhat regularly get dinner, sometimes with my husband, Andy, sometimes with others while he was still at a church meeting. I noticed over time that I bonded pretty deeply with the servers and the bartenders. They became a bit like family to us. As I tried to articulate why that was, I found myself saying, “The other person in my life who regularly made sure I was fed is my mother.” There was muscle memory, it turned out, between being fed and feeling loved. Sure, we liked the staff at the bar—we got on well and laughed together, but the bond that was formed was one of provision. They looked after us, and we began to see the bar as a safe space and a sort of second home. That kind of bond is part of what it means to do life together, and it is hard to get that bond when you don’t bring bodies into account. When I think of church planting as a whole body work, I think of provision more generally. People often say, “Church isn’t the building, it’s the people,” and while that isn’t untrue, what we miss is that people gathered inhabit space and time. If we are to care for each other, to nourish each other, or offer rest to each other, real physical space is needed. Real physical elements are needed. And part of pastoring, part of church planting, is making a space that is prepared. This can’t be done by solely putting our theological education into words and reading it out loud. We can’t do this as dis-embodied, talking heads, beamed into a blank holding space of chairs all facing one direction. Church life together—the sacraments—is embodied and inconvenient. They require the whole body—the moving of chairs, the setting of tables, the baking of bread. They require the sitting with and the listening to, the working alongside and the wading through with. For me, at my little church in Philadelphia, it required the shoveling of snow in winter and the schlepping of electric fans in summer. It required paying attention and bearing witness, cleaning up scraped knees, and painting building signs. At PTS, we are looking to do life together. We are training leaders up to make and convene space for folks to live life together. We have made a significant step toward this with our Barbour Library renovation. Not only does the Library make space for all manner of neighbors, groups, and friends to gather (You can bring snacks! You don’t even have to be quiet! ), there is a dedicated space in the Library, called the Integrative Learning Space (pictured above). 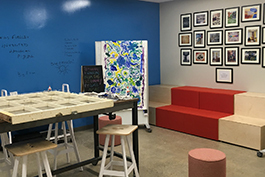 This space invites students, small groups, and community members to think about how we make space and set the table for folks to do life together. The space is indestructible and stocked with supplies to make communal art and liturgical aids, banners for the seasons, Bible time lines, signs for orienting guests, materials for stained glass mosaics, paints for re-visioning pastor thrones, and all manner of other things that might make space for people to enter in and find a way to share life together. We hope you’ll use this space to make your own welcoming spaces, spaces where God can enter in and make us known to each other in the breaking of bread and the hearing of the Word. The Rev. Karen Rohrer is director of the Church Planting Initiative at Pittsburgh Theological Seminary. Before joining the CPI team, Karen was co-pastor and co-founder of Beacon, a Presbyterian Church in the Kensington section of Philadelphia. The saints of Beacon taught her contextual ministry, the joy of being church, and the unique grace of being a lady pastor and boss in a neighborhood of matriarchs. The building of Beacon taught her amateur handy-woman and moisture remediation skills, and that a particular space really can be a reminder that you are loved. As director of the Church Planting Initiative, she is excited to vision new ways the church can bear good news to the world and to support and resource the leaders God is calling forth to make it so.